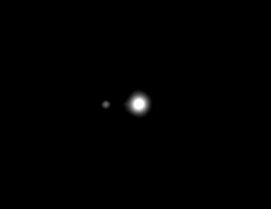 Neptune and its moon Triton on 12th July 2011, taken using the LT's RINGO2 instrument operating in a non-polarimetry imaging mode. © 2011 R. Smith and LT group. Neptune was observed by the National Schools' Observatory on 12th July 2011, when the planet occupied exactly the same orbital position it did when discovered on 23rd September 1846. Neptune's "year" is 164.79 Earth years, so it has now made one revolution of the Sun since its discovery. Observations like this take very little time to perform but can capture the imagination of students and professional astronomers alike. As the NSO explains, Neptune was the first planet discovered through a rigorous scientific process rather than chance observation. This observation by a fully robotic telescope reminds us how astrophysics has changed in the one Neptunian year since Johann Galle first saw it.